More than half of all schoolchildren have been bullied. Although lip-service is often paid to anti-bullying policies, the torment of bullying continues to be real and widespread and the damage done is lasting. 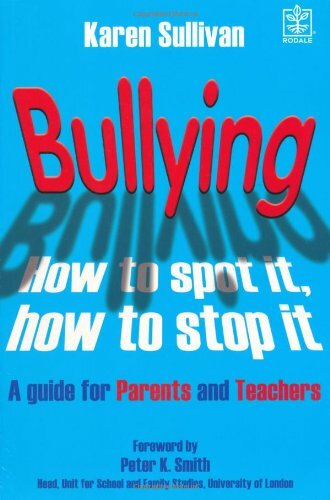 It explains what causes children to bully, why bullying is on the increase, what makes a child a victim, and how children can develop coping skills to deal with problems at school and on the streets. A complete guide for all parents and teachers, it shows you how to stay alert to problems andhow to tackle them when they happen. There are lots of books on bullying for teachers and other professionals, books for children themselves, and books on workplace bullying, but nothing quite like this wide-ranging, up-to-date, proactive guide to every aspect of school-age bullying. Karen Sullivan specialises in writing about childcare and physical and emotional health and is the author of several books, including How to Help Your Overweight Child (Rodale/Pan Macmillan). She has appeared on GMTV, BBC1 and BBC2, UTV and the Wellbeing channel, as well as on numerous radio programmes.